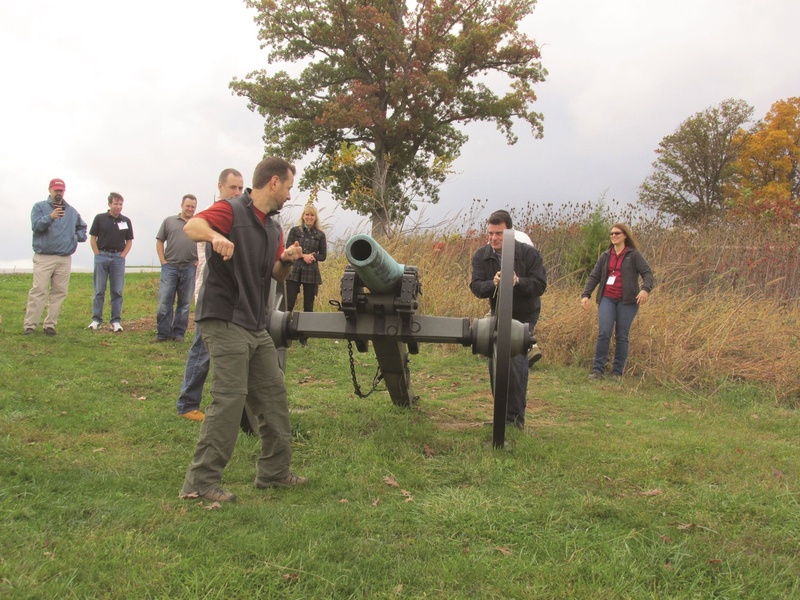 Every "In the Footsteps of Leaders" program is delivered by expert teams dedicated to ensuring ultimate success from the Gettysburg experience. Seasoned battlefield guides give fascinating and engaging accounts of the dramatic events of July 1863. Expert facilitators are on hand to bring the historic events forward into the 21st century. Experienced Gettysburg Foundation support staff will coordinate all of the logistics, so that participants can focus 100% on the development of their team. Sue is a native of Danville, Pa. She graduated with honors from Geisinger Medical Center School of Nursing and Pennsylvania State University. Sue worked as an emergency department nurse for 23 years. In 2000, she became a Licensed Battlefield Guide and received the Superintendent's Award for Excellence in Guiding in 2005 and 2006. In 2002, Sue joined the Gettysburg Foundation's Museum Design Team during the project to build the new museum and visitor center complex. Her responsibilities included identifying images for museum exhibits, identifying artifacts in partnering repositories and assisted in refining the museum script. Beginning in 2004, she served as historical consultant for the Gettysburg Foundation. From 2005 to 2008, Sue served as research historian for the Gettysburg Cyclorama conservation project. She authored the book The Battle of Gettysburg Cyclorama: A History and Guide and The Gettysburg Cyclorama: The Turning Point of the Civil War on Canvas. Sue has also published the book Elizabeth Thorn: Wartime Caretaker of Gettysburg’s Evergreen Cemetery and several articles on the history of the American Civil War cycloramas. In 2007, Sue developed Gettysburg Foundation's leadership program In the Footsteps of Leaders. She currently serves as Leadership Program Director, and has led leadership tours for corporate, nonprofit, government and educational groups. Howard Burrell joined the Gettysburg Foundation's Leadership Program as a facilitator in 2015. He adds a rich background of experience in leadership and education. As an adjunct professor in the Classics Department of Duquesne University, Howard taught linguistic history, medical history and medical terminology. Howard also served as a pastor for the United Methodist Church for over three decades. In this role, he provided guidance and education in leadership, fiscal management, and long-range planning. As pastor, he taught leadership forums with emphasis on leadership development and team building. As co-founder of both Hope Hospice of Pittsburgh and the Spina Bifida Association of Western Pennsylvania and Quality Control Supervisor and Trainer for SMG Circuits, Inc. as well as President of Burrell Associates, LLC, Howard understands leadership at all levels of interpersonal relationships and management in both the for-profit and non-profit world. He provides group facilitation that combines management theory with practical application to demonstrate how effective leadership skills are applied day to day in the workplace. Some of the groups he has facilitated in conjunction with Gettysburg Foundation's Leadership Program include such diverse organizations as the US Defense Department, the US State Department, the Penn State University Athletics Leadership Program, the US Army and US Navy Leadership Programs, Dickinson College and Chick-Fil-A, Inc. to name a few. Howard earned his Bachelor of Arts degree in Ancient and Modern History from Geneva College and he holds a Master of Arts degree in Historical Theology from Duquesne University. He earned a Master of Divinity degree from Asbury Theological Seminary. Howard has provided Gettysburg Foundation with his expertise as a volunteer in many areas starting in January of 2012 to the present. Currently he is a docent for the George and Elizabeth Spangler Civil War Field Hospital Site and helps in the garden at the Sherfy Farm. He and his wife Carolyn reside in Gettysburg. A historian for the Gettysburg Foundation’s In the Footsteps of Leaders Executive Program, Colonel Tom Vossler served the U.S. Army for 30 years from 1968 to 1998. He earned a Master of Arts degree from Georgia State University. Tom has taught military history, strategy and leadership at the U.S. Army Military History Institute. Additionally, he is a Licensed Battlefield Guide at Gettysburg. Tom has co-authored two books about the Battle of Gettysburg. The most recent book A Field Guide to Gettysburg: Experiencing the Battlefield through Its History, Places, and People is co-authored by Carol Reardon. He currently resides in Gettysburg with his wife Barbara. Licensed Battlefield Guide Larry Korczyk earned a B.A. in economics and business administration with a minor in physical resource management. He spent 30 years working as a manager in the logistics and distribution field. With a strong interest in the American Civil War, Larry first visited Gettysburg in 1990. In 2012, Larry realized his dream to become a Licensed Battlefield Guide and moved to Gettysburg with his wife Lori. Larry has been a Civil War reenactor for 25 years with the 2nd Rhode Island Infantry, a member of several Civil War round tables and the past President of the Association of Licensed Battlefield Guides. In 2017, he realized a second dream and became a published author of a book he co-authored entitled Top Ten at Gettysburg. Since that time he has had two articles published in the Civil War Monitor magazine. He a frequent lecturer before Civil War roundtable and works part time for the Gettysburg Foundation. Licensed Battlefield Guide Paul Marhevka earned a bachelor's degree in business administration and is an accomplished entrepreneur. From the time he graduated in 1982 until 2008, he worked for his family business, having been CEO of the last seven years of operation. The business was a woodworking manufacturing plant with over 40 employees that generated $4 million in sales annually at the time of sale. His duties included running human resources, accounting, inventory, customer service and pricing. Overlapping with his tenure as CEO of the woodworking plant, Mr. Marhevka also owned and operated a fleet of trucks. Having earned his license in 2001, he sold both businesses in 2008 to work full time as a Licensed Battlefield Guide at Gettysburg. He has been happily married for the last 37 years and has a 32-year-old daughter. Ed Suplee graduated from Washington & Lee University in 1970 and spent two years in the army as a lieutenant in charge of a tank platoon. He retired in Chicago from the MetLife Insurance Company as a Vice President in charge of service and sales of employee benefit programs to Fortune 200 corporations where he was responsible for a division with $2 Billion of revenue and over 700 employees. At MetLife he was also an instructor for a number of MetLife’s internal officer and director management programs. Upon retirement he moved to Gettysburg to fulfill his lifelong goal of becoming a Licensed Battlefield Guide which he attained in 2004. He is also currently an instructor for Elderhostel (now Road Scholar), the Harrisburg Area Community College, and has been an instructor with the Civil War Institute of Gettysburg College. Licensed Battlefield Guide Paul Bailey is a retired Army Lieutenant Colonel and Operation IRAQI FREEDOM veteran. His last military assignment was with the United States Joint Forces Command Deployable Training Team, which prepared two, three, and four star headquarters to deploy to Afghanistan, Iraq and other overseas contingency operations. Paul was a facilitator for the National Defense University CAPSTONE program, the senior leader education program for newly promoted General and Flag Officers. Today, Paul works for the Department of Defense as an exercise support / training assessment specialist for the Joint Staff J7 in Suffolk, Virginia. Paul has been a part time guide since 2010 and has supported Gettysburg Foundation's Leadership Program since 2014.